My name is Tony, and I'm the loving father of my 5 year old daughter, Gabriella - we call her Gabby for short. Gabby is just like every other child her age. She loves games, toys, art, and is even a bit of a geek like her Daddy. Back in August 2016, our families' lives changed forever. On one Friday afternoon, Gabby came down with what appeared to be a cold. We had her lay down for a nap around 4PM - a few minutes later, she began coughing profusely to the point where she vomited on herself. My wife, Megan and I immediately jumped into action. She worked on cleaning up the bedclothes, and I worked on getting Gabby cleaned up. As I was taking her out of the bathtub, she looked up at me, and I was deeply shocked at what I saw - her eyes were filled with blood. We called our pediatrician right away, and she recommended we go to the Emergency Room to have them check Gabby out. 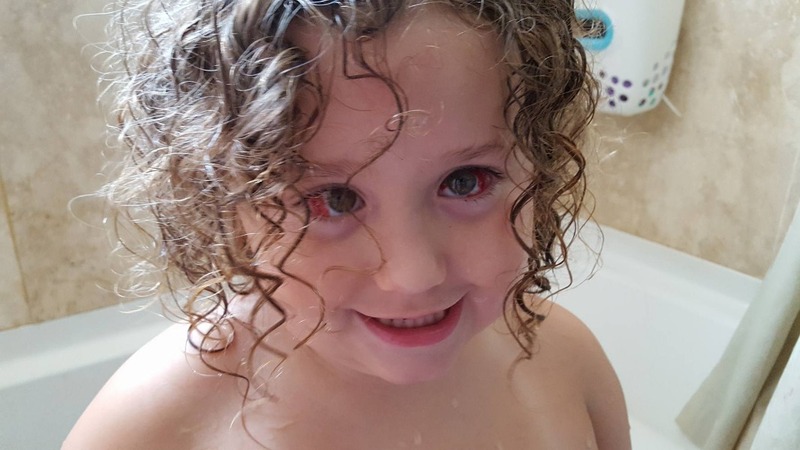 After nearly 6 hours of waiting, and having doctor after doctor come in with amazement to see her eyes the way they were, they ultimately diagnosed her with a subconjunctival hemorrhage and sent her home. That following Monday, we went to our pediatrician for a follow up, and what she saw concerned her. Not only had the hospital missed a major diagnosis of pnemonia, but the blood in Gabby's eyes, and also now her ears, was fresh. No signs of any bruising or healing that you would see after days of a subconjunctival hemorrhage. She ran some blood tests and was concerned with the results. 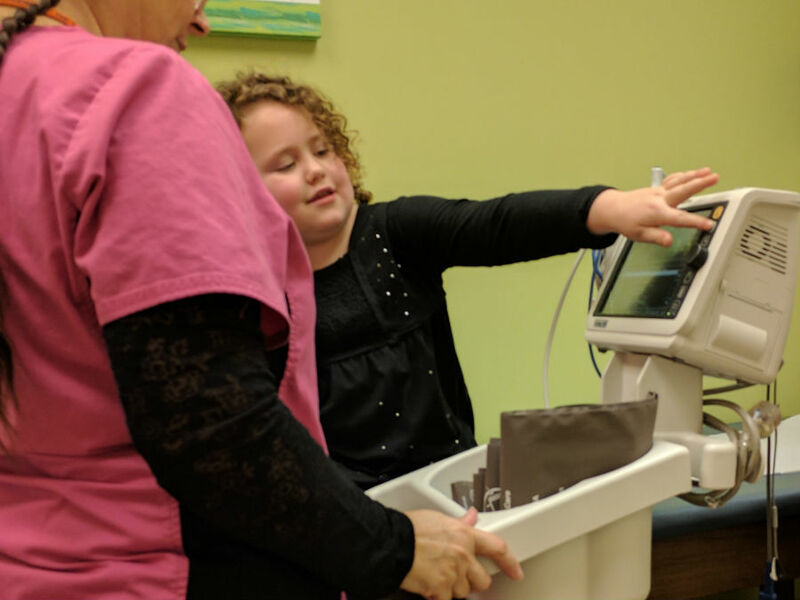 She noted then that she didn't want to worry us until further testing was done, and asked if it was okay to setup a date and time with the University of Virginia (UVA) Children's Hospital for further testing. UVA hospital is approximately a 4 hour drive, each way, and we went through several trips to have Gabby tested. Everyone, including the doctors at UVA, were astonished at the results. 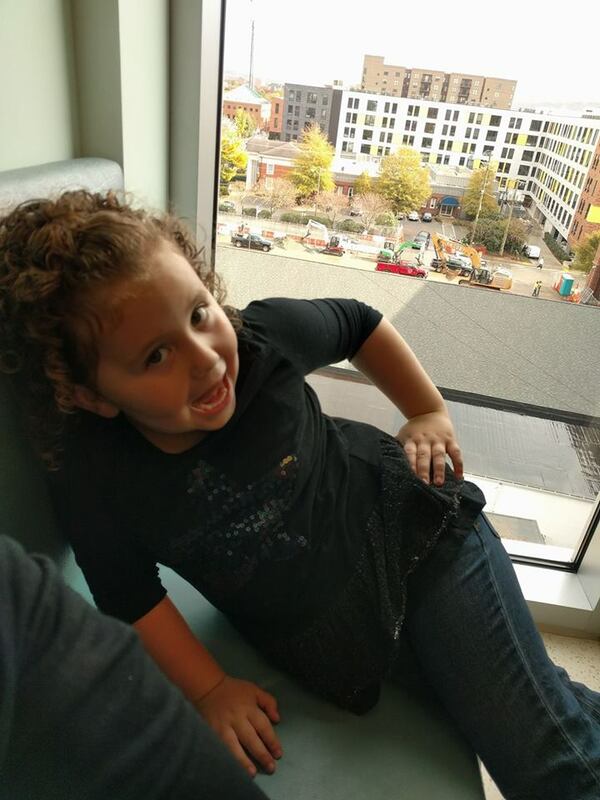 My daughter was diagnosed with Inherited Factor VII Deficiency, a lifelong condition, and the first case of it's kind at the UVA Children's Hospital. With fewer than 200 documented cases, and a rarity of 1 in every 300,000 - 500,000 people, this came as a massive blow to our family. UVA informed us that any and all surgeries need to take place at a hospital with a hemotology ward, meaning our closest outlet was at least 4 hours away. 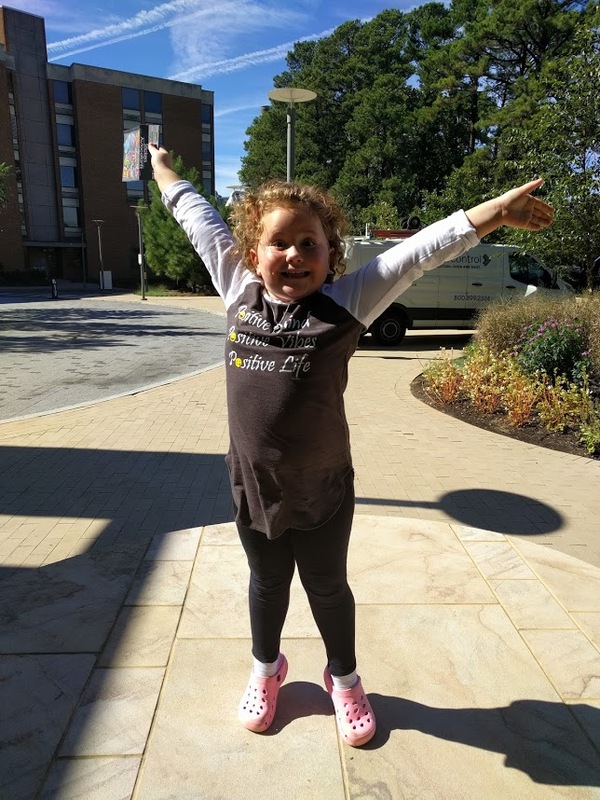 To make matters worse, Gabby had already been informed that she would need some dental work done prior to her diagnosis, and we were now informed that, not only did UVA now need to do the dental work, but to have it done, it would also require surgery and specialty medicines. What would normally be a same-day, few hour treatment at a dentist for most people is now a 3 day venture with a hospital stay for my daughter. We lined the proceedure up for work at UVA. Medical insurance kept denying them, but they kept trying to get it approved anyways. Prescription costs were quoted in the thousands, and a rough estimate for the entire proceedure was in the tens of thousands. With very little support from our insurance, and no medical assistance programs we qualify for that support this condition, most of the bill is expected to fall back on us. The only prescription that can assist a bleeding incident is called NovoSeven RT, which requires 15-30 mcg/kg every 4-6 hours until hemostasis is achieved . Or in Gabby's case, a 1mg vial every 4-6 hours after any trauma. With a cost of approximately $1,800 a vial, a simple injury could cost us more than our mortgage payment! To further complicate matters - Factor VII deficiency is so rare, that not many people know what it is! It's not hemophilia, but the National Hemophilia Foundation does try to educate people about this condition as a rare bleeding disorder. Those with Factor VII deficiency experience joint and muscle bleeds, easy bruising and bleeds after surgery. Bleeds can also occur in the skin, mouth, nose and genitourinary tract. 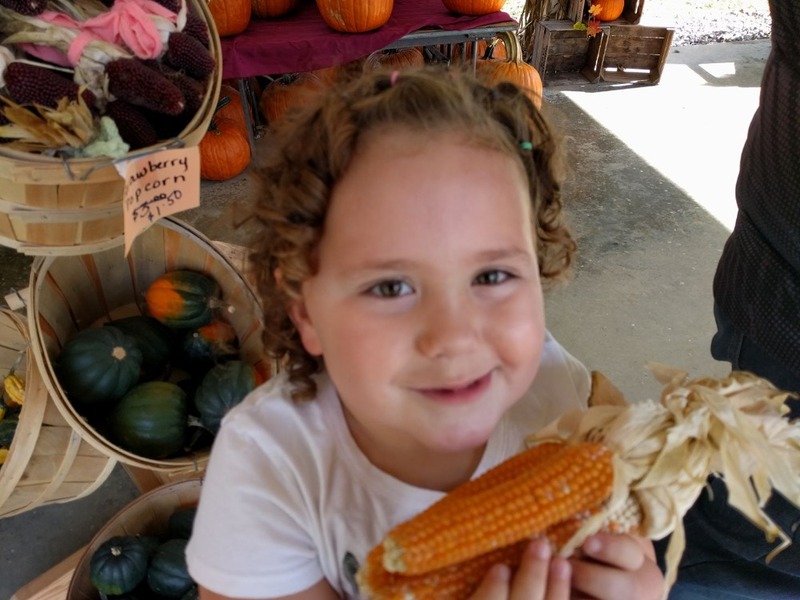 Gabby has noted that when she grows up, she wants to be a scientist and find a cure for her condition. I'm a hard working dad. I work three jobs, one full time and two part time, to help make ends meet. My beautiful wife is a stay at home mom who focuses all of her efforts on nurturing our two kids, homeschooling them, and keeping them on the right path. Honestly, I never thought it would come to this (in fact, I'm doing this without even telling the wife - though I'm sure she'll find out quickly) - and I never thought I'd even try crowd sourcing - but I'm not sure there's any other way. 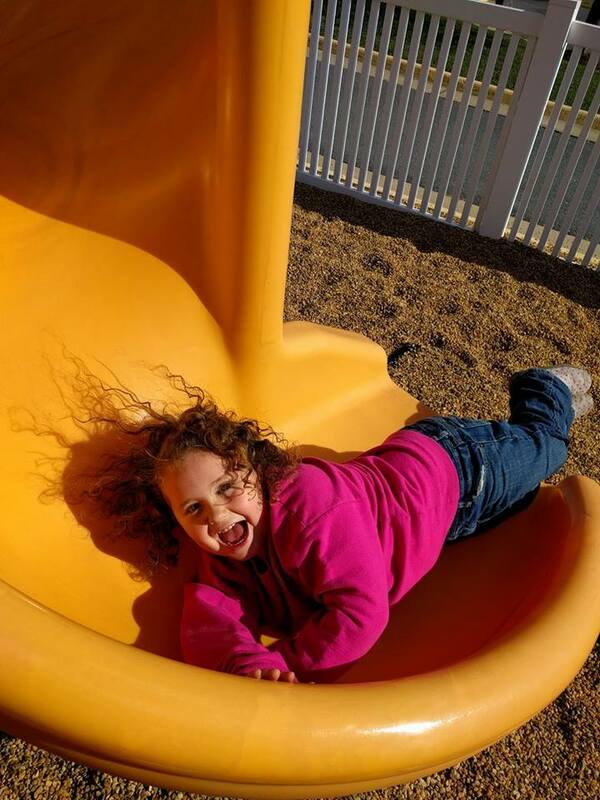 If you find it in your heart to give anything, no matter how large or small, please rest assured it will only be utilized for medical bills and expenses - both now, and if there's any left, for future medical needs for Gabby. All of your support and prayers are greatly appreciated. Hey everyone! We have some exciting news! 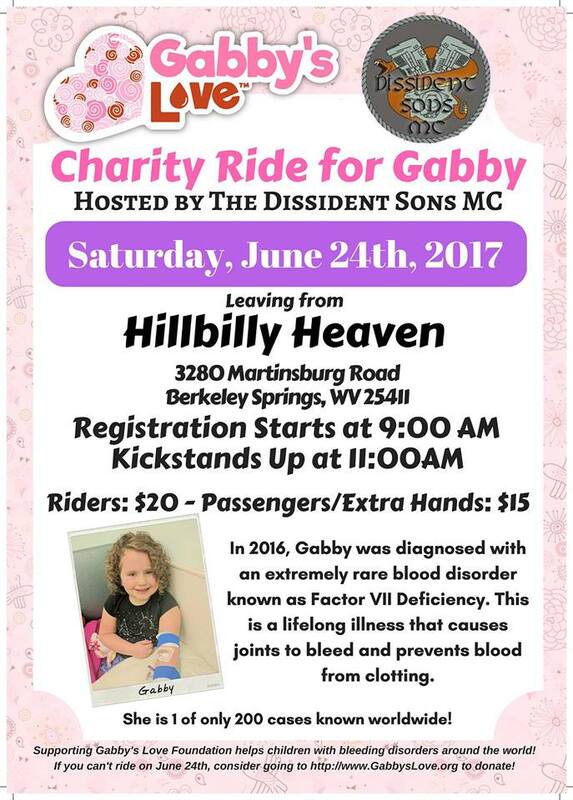 The Dissident Sons MC is hosting a Charity Ride for Gabby on Saturday, June 24th, 2017! This ride is to raise awareness about her condition, as well as help fund her every increasing medical bills. Don't have a motorcycle? No problem! Post ride, there will be a huge after party at Hillbilly Heaven! Come on out and help support Gabby, have some fun and raise awareness about Factor VII!! Hey everyone! It's been a few weeks since our last update, so I wanted to share some good news - and some upcoming things. First off - We did get *some* insurance coverage after all! This means we've lowered our 'Goal' down to $10,000, which is approximately the amount we're going to be liable for this year. This means we're *much* closer to the goal than we were a month ago! 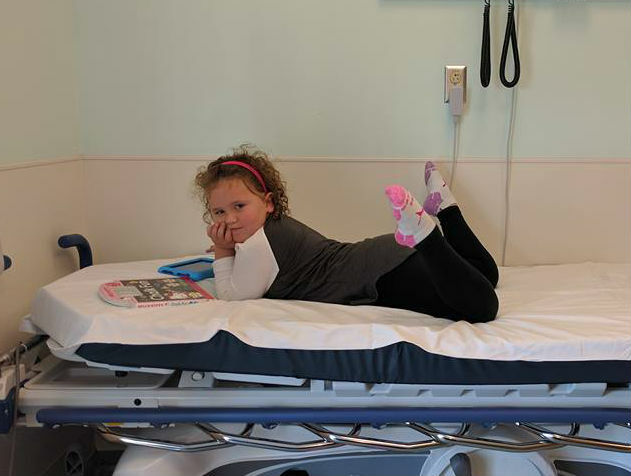 It's been a long battle with insurance, as we were told they didn't have charge codes for her condition and that it would take 5-6 weeks *after* surgery to even get them established. They denied medicine for her condition time after time, and finally we were able to work with Novo Nordisk (for the NovoSeven) for a copay assistance program, as well as working UVA for her Amicar on a special medical necessity program. This is *huuuuuge*, as it's a major step in the right direction! Now finally, some upcoming events. 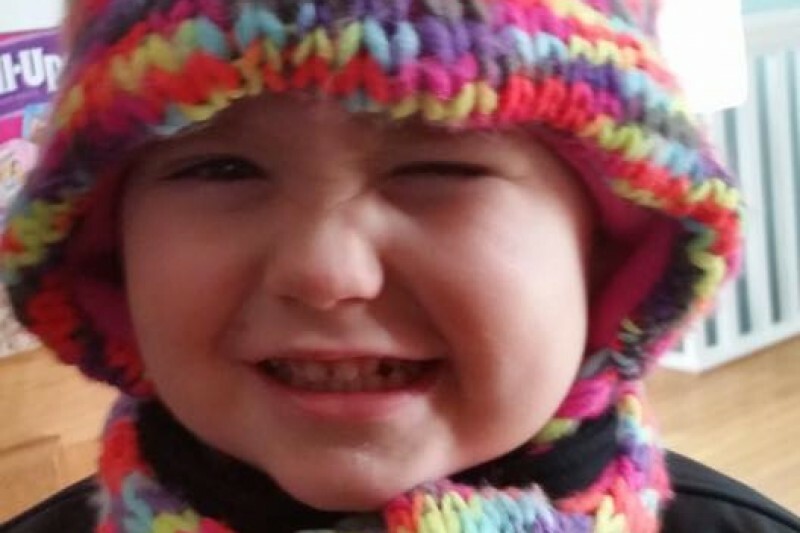 Tomorrow evening, Gabby has a special pediatric sleep study taking place. There's still a huge concern of sleep-disordered breathing (SDB), but it's still thought that it's associated with her enlarged tonsils and adenoids. Pending the results, we're looking at the probability of a more intensive surgery for the removal of them. Outside of this, the last few weeks have been calmer than they had been prior. 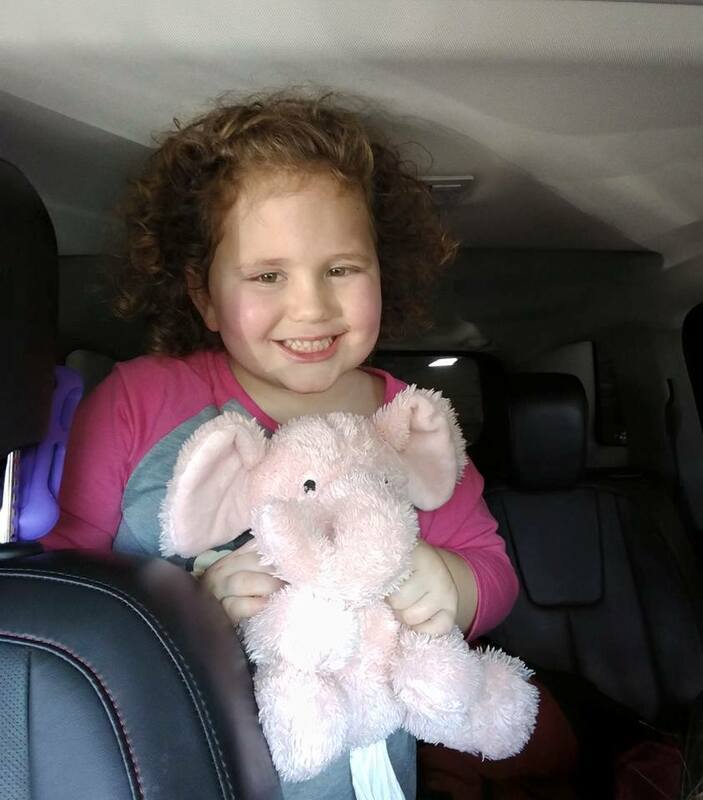 We're still working on getting Amelia (Gabby's sister) tested, but since UVA will not accept anyone's hematology labs outside of UVA, we're bound to waiting for a new date to head back for the long drive. 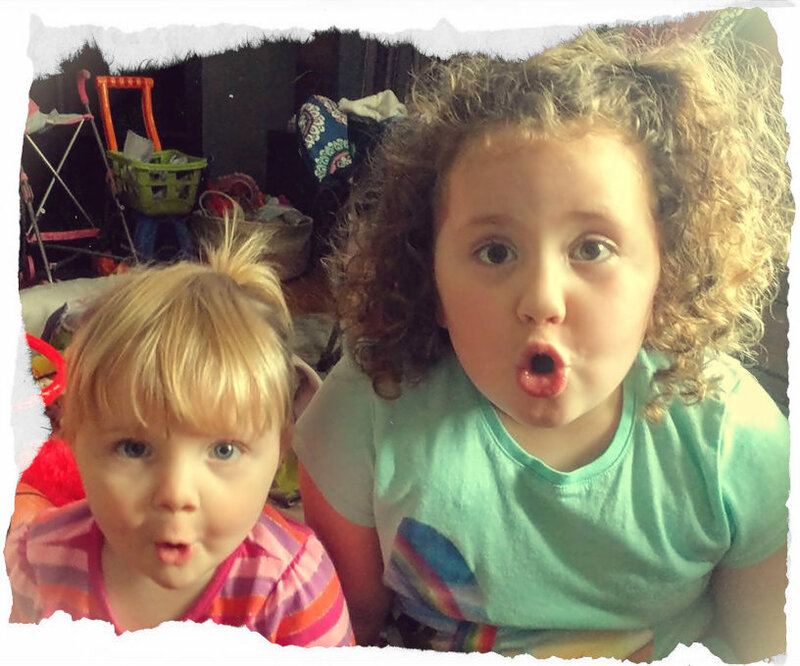 Gabby & Amelia Shocked With The Update! WHAG's 'Focus on the 4State' interview has been attached to this update! Let's face it, there's only so much attention a 5-year old could definitely give! Honestly, during the interview, I wanted to stay focused on the interviewer, as I had a feeling that Gabby wasn't going to sit still. After the interview, the producer said that not only did Gabby's personality show through, but she was officially the only guest to every wrangle out of her microphone! If you're like me, you'll probably watch the video laughing until you cry -- and then again to actually listen to the interview! As always, please share this update - I'm asking for as many shares as possible to get the word of Gabby's condition out. This GoFundMe has opened up a whole new horizon for us - not only in helping with medical expenses, but also opening the doors to nurses and hospitals who have treated adult-FVII cases, as well others battling with Factor VII themselves. We have some big news coming soon, and we hope that Gabby's story can inspire so many more. Today we had an appointment with a pediatric neurosurgeon from UVA who ran some basic tests in his remote office today. 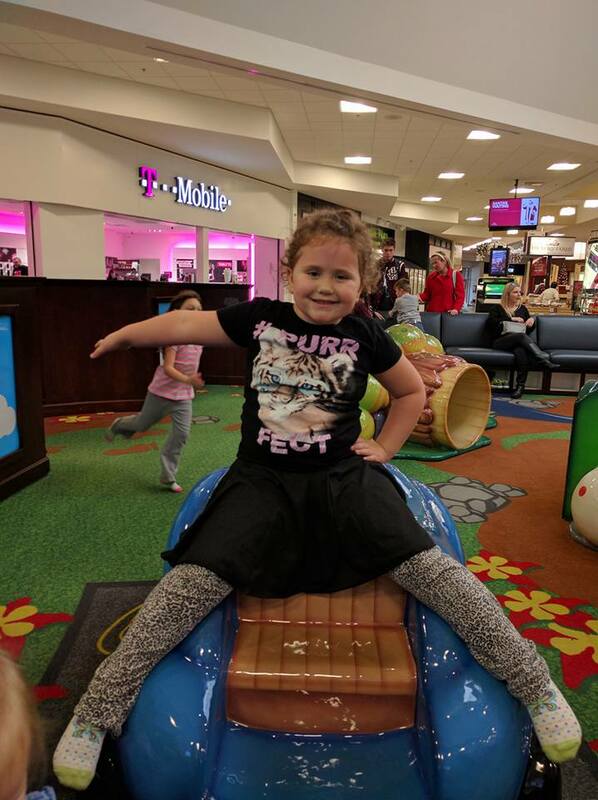 There's some concern that she may have diastematomyelia of her spinal cord, and she'll have to go through a few months of different testings. First up? A sleep test. -- After her first surgery, and the problems they had with her breathing when coming out, there's a huge concern of sleep-disordered breathing (SDB). There was enough concern for the anesthesiologist to come back and explain that he thought that her adenoids and tonsils may need to be removed before doing further surgeries due to their enlarged state. Followed by? Well - the adenoid and tonsil removal. Which with her Factor VII Deficiency, can cause it's own handful of issues. Due to the bleeding that takes place from the remove of these, she's looking at a minimum stay of approximately a week -- and longer if needed. Needless to say, while it's good that we're getting this all treated, as her parents - our hearts continues to sink more and more in the process. As always, we thank everyone who has donated, prayed or shared our updates. Gabby received her thank you cards today, and will be getting them out later this week for anyone who has left their address for her! One last note - as many of you are aware, WHAG asked Gabby and I to be on 'Focus on the 4State', a live broadcast we did on Tuesday - and aired Saturday morning and Sunday night on WHAG. While the 5 minute clip hasn't been posted to us yet to put on here, we got to watch it in all of it's quirky glory last night -- let's just say, her 5 year old bubbly personality *definitely* comes out! As soon as we get a copy, we'll be posting a new update for you!